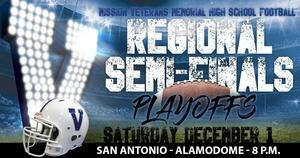 Pre-sale ticket sales for the VMHS Regional Semi-Final football game at the Alamodome will end at 3:00 p.m. Friday, November 30. 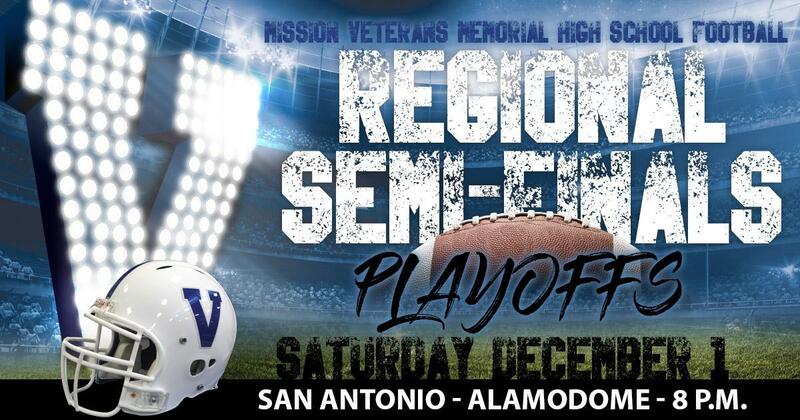 Mission, Texas- Ticket sales for the Veterans Memorial High School (VMHS) Regional Semi-Final football game at the Alamodome in San Antonio will start on Tuesday, November 27, beginning with season ticket holders. Patriot football season ticket holders can start purchasing tickets Tuesday morning from 8:00-11:45 a.m. Regular ticket sales will begin Tuesday afternoon from 1:00-4:45 p.m. Ticket sales will continue Wednesday and Thursday from 8:00-11:45 a.m. and 1:00-4:45 p.m. Ticket sales on Friday will be from 8:00 a.m.-noon. (update-time extended until 3pm) Tickets will be sold from the Mission CISD Athletics Department ticket window located at the district central office building, 1201 Bryce Drive. Pre-sale tickets will cost $7 for students and $11 for adults. Tickets at the gate on game day will be $13.